Fashion Foundations (Part 1?!) « It's For My RP Spec! 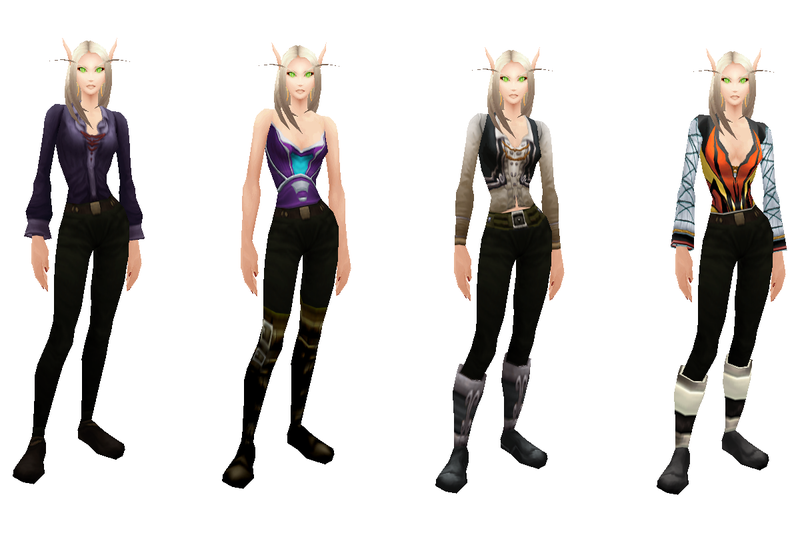 First up are the true basics: things that appear in a lot of the outfits I’ve put together. These are some great staples to have on hand for several reasons, including the basic black and white colors. Note: The Knitted Sandals will be featured throughout. They go with just about anything, so there’s no need to give them their own outfits! I think I’ve mentioned before that the Sleeveless T-Shirt is one of my all-time favorite pieces because I love the deep v-neck robes with the shirt underneath. The revealing nature of the plunging neckline doesn’t really “fit” a lot of my characters, so layering the shirt makes the dresses wearable without being too “trampy”. Another great use of this shirt is to add a little more detail to the Runecloth Robe-style robes. It adds both a little texture in the front and back cutouts and coverage for a character who wouldn’t really bare their belly. Next we move onto the belt. 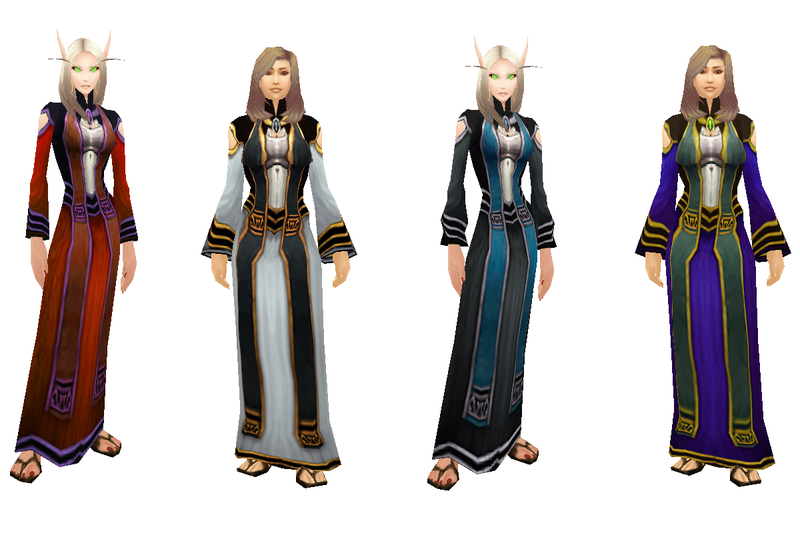 The Arcane Sash is an excellent black belt to add to any outfit that is not brown-based. 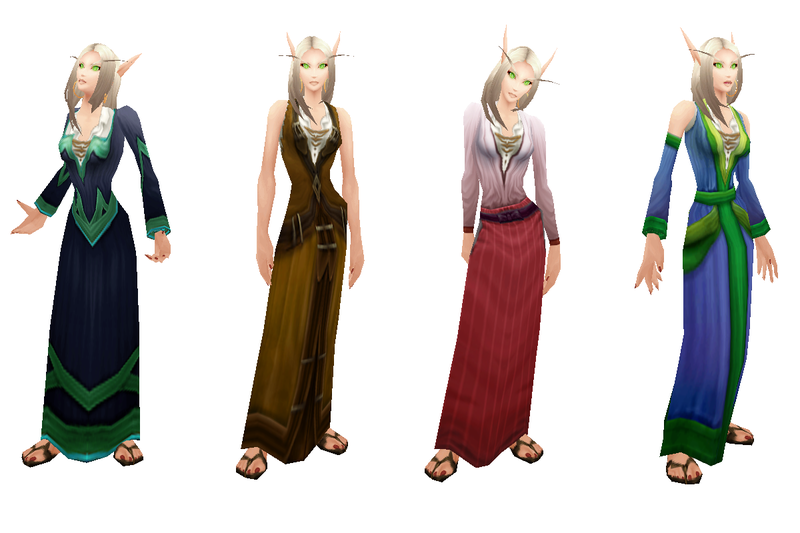 None of my characters wear a lot of brown, so I honestly haven’t even looked for a plain brown belt. This is a green-quality item, so it does bind… but it’s really worth it. Ah, Tuxedo Pants! Black pants that can provide a great base for that shirt that has no matching skirt or that randomly-colored top that you’re unsure how to pair. Never fear, fashionistas, because the Tuxedo Pants are there to be your go-to bottom! Assume that the pants in all of these outfits are Tuxedo Pants. And this concludes what will probably be just the beginning of my posts about basic fashion pieces.